There are so many diets out there – some touted for commercial interests, some sold as weight-loss plans, and many focused on treating diseases. Looking for the right nutrition plan can get confusing – if not downright complicated. If your doctors have diagnosed you as overweight or obese or with an illness that requires certain nutrition and/or eating requirements, they’re likely to send you to a registered dietitian who will put you on a nutritionally-balanced diet that fulfills a regimen or caloric-count estimated for your personal estimated daily needs. Though not a diet, per se – one basic tool to control food intake that is currently popular focuses on portion size and the quantity of protein and vegetables on your plate. It’s a a rough guide to getting away from calorie counting. This is generally a 3-meal-3-snack day on small plates to discourage large portions while eliminating hunger with the in-between meal snacks. The most important part to remember with this method – called the plate method – is that half of your plate should be filled with non starchy vegetables. The other two fourths are filled with lean protein and a whole grain or starch like brown rice, potato, or sweet potato. Snacks are defined to help you get high nutritional value with low-caloric intake. A good snack will include fat, protein, and carbohydrate to help keep you satiated and to maintain good blood sugar levels – for example, apple slices with one teaspoon of almond butter. Most snacks should be kept to around 100 calories. The plate method is a commonly recommended dietary tool to help change the behavior of over consumption and for people who don’t like counting calories or weighing their food. Weight loss is definitely achievable with this behavior-change tool. It is a good rule-of-thumb practice. Be aware, it doesn’t work for everyone, but it is popular and an easy, more-simplified way to eat the proper portions that can lead to weight loss. So let us say – you decide to try the plate method for consumption control, but you have a serious health issue that limits the foods you can eat or that you have food allergies; this will impact what goes into the content and portions on your plate. What if you have more than one health issue? That’s when it can become complicated. A food recommended for one illness – may be exactly what you are told is not recommended for another illness – so you feel embattled – wondering if there’s anything you CAN eat. This is where seeing a registered dietitian is very helpful. Registered dietitians are trained in Medical Nutrition Therapy and can give you guidance in building a nutritional balance but ‘safe’ diet to fill your plate. As an example, let us say you have fatty-liver disease (FLD) – you will likely be put on a weight-loss diet – and the above rule-of-thumb plate-size-and-portions diet is what may be recommended; and on top of FLD you may have some intestinal problems – such as leaky gut or other autoimmune problems or diverticulosis or diverticulitis – that require food adjustments to accommodate foods you can and cannot eat. It’s common to cut out red meat, dairy, and grains – but it isn’t the same for everyone; and it can get really complicated or fun – if you like looking for recipes good for the tummy. Either way, you would try to stick to the portions recommended in the plate method while cutting out any of the foods that exacerbate the disease condition. You may be a diabetic or borderline diabetic – and invariably you will be told – cut out the sugar and processed foods (which all of us can do whether diabetic or not) and to cut down on other foods related to your illnesses, such as soda, candy, bread, rice, potatoes, and corn – starchy vegetables and highly processed grain products. It’s important to eat at regular intervals so that the blood sugar stays level, which is where the snacks from the plate method comes in really handy. 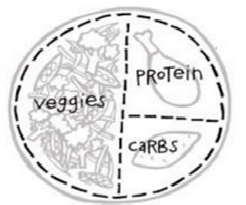 The plate method can work very well with the traditional diabetic diet of carbohydrate counting. Remember to count your carbohydrates and put them in the proper places on the plate. Hunger is complicated, as well. Hunger and craving can be confused with each other. If you just ate a ‘good’ meal, it’s possibly craving you’re feeling. But if you have leaky-gut or a condition where the nutrients are not readily absorbed in the gut, it could possibly be a nutritional-craving. The way to deal with emotional craving is through behavior changes – i.e., finding new behaviors to replace the craving and discourage returning for more food even though you’re full. Everyone has different strategies to accomplish control of food cravings. As I mentioned, finding the right diet or nutrition plan can be very challenging and confusing, but it can be done. You can do it! Using a tool like the plate method can help you with portion control, and seeing a registered dietitian can help you create a healthy safe nutrition program that is tailored specifically to your needs. Good luck! !